As some of you already know, I teach and exhibit at some of the largest craft fairs across the country. I’m an expert tutor at the Knitting and Stitching Shows and Living Crafts Fairs, for example. A lot of work goes into getting prepared for these shows, particularly if you’re a perfectionist like I am. Whenever I exhibit, I do my best to create a cosy stand that showcases what’s new in the world of rag rugging. Below is my stand from a fair earlier in the year, for example… I like lots of colour! Our Ragged Life rag rug stand from early in 2018. Apologies for the poor lighting. 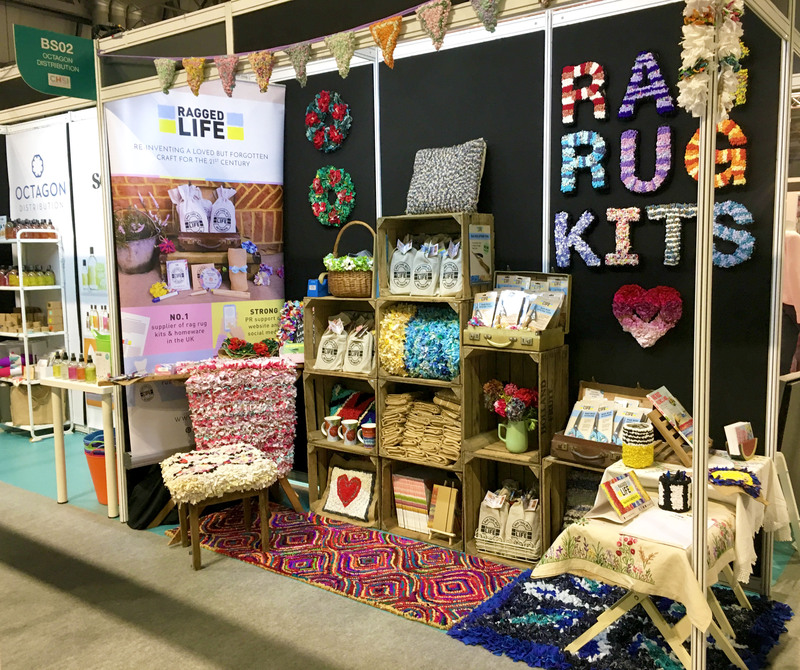 Earlier this year, we were all about showcasing our new Rag Rug Bouquets, which went down an absolute treat at the Spring Knitting and Stitching Show. Well, the second half of the year is no different and we’ve got some gorgeous new products to showcase at the Ally Pally Knitting and Stitching Show next month. (Don’t worry if you can’t make it to the show itself, I always do a follow up blog post for everyone to see after the fair). Up until now, I’ve used my rag rug letters to great effect on the stand. After all, I’ve made so many letters by now that I can spell out just about anything. However, I’ve always wanted a rag rug that literally screams Ragged Life. Well here it is in all its glory… What do you think? 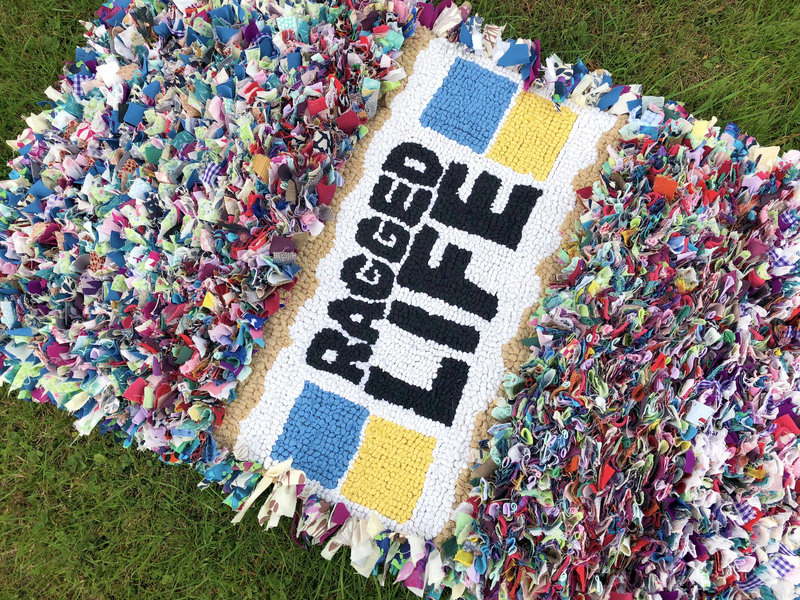 Our new Ragged Life company rag rug. 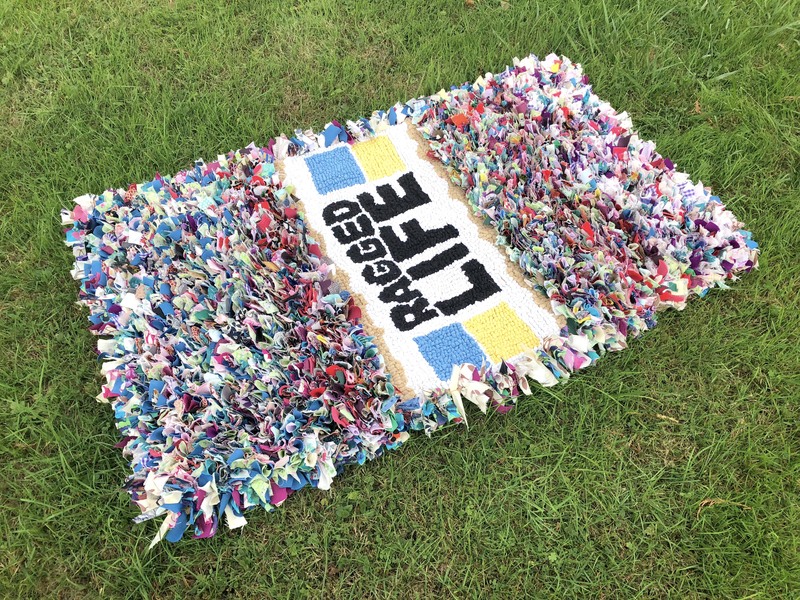 Our Ragged Life logo rag rug was designed to use up all the little offcuts and odd pieces of fabric I had lying around, so there are truly hundreds (and possibly thousands) of different colours incorporated. The rug measures 100 x 60cm, as it was made using one of our pre-hemmed Medium Sized Rug Hessian. Here you can see the loopy and the shaggy rag rugging close up. What’s more, it neatly demonstrates the two main techniques of rag rugging (loopy and shaggy) for anyone new to the craft, which means it’ll be easy to explain the differences between the two while busy on the stand. 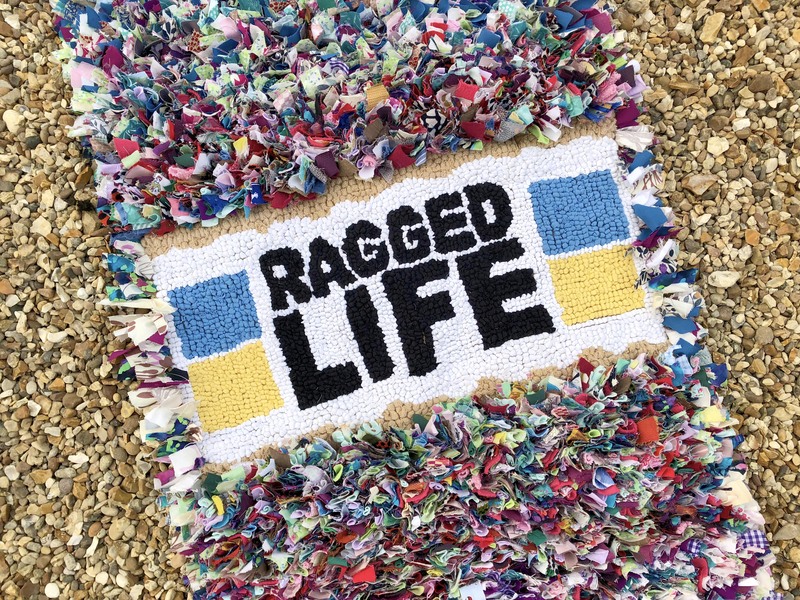 The Ragged Life logo stands out well because there’s a buffer zone of loopy rag rugging around the logo itself. The rug fits brilliantly with our colourful aesthetic and we were able to get a really crisp logo for our company rag rug by using small loops in the loopy central section of the rug. The rug was made using small bits of fabric from all my leftover fabric bags mixed together. The shaggy pieces of rag rugging become a bit blurry when put together, just like gravel. The shaggy rag rugging is made up of a real mix of different colours, including patterned and plain fabrics. Got some old fabric lying around and fancy making a company rag rug for your small business? Learn how to make one with a Ragged Life Rag Rug Kit. 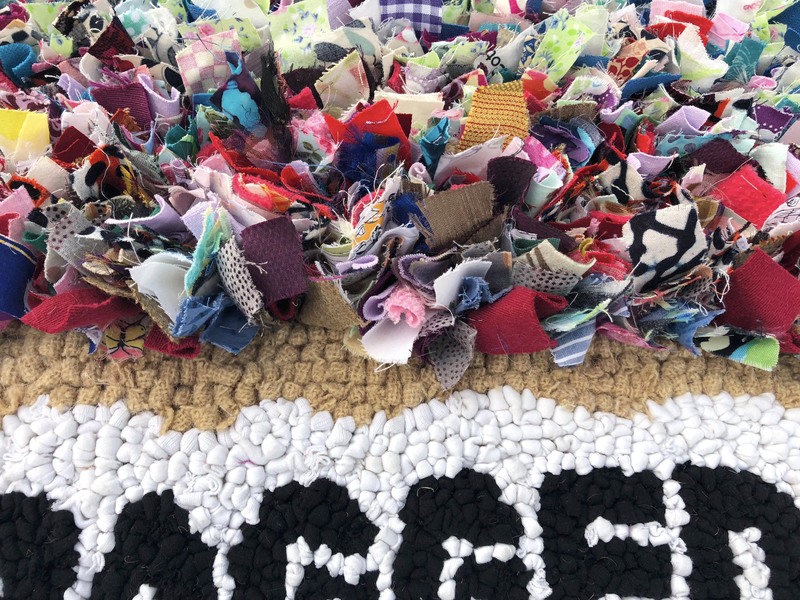 Rag rugs are endlessly customisable, so the sky’s the limit! So, that’s our latest shaggy / loopy company rag rug. 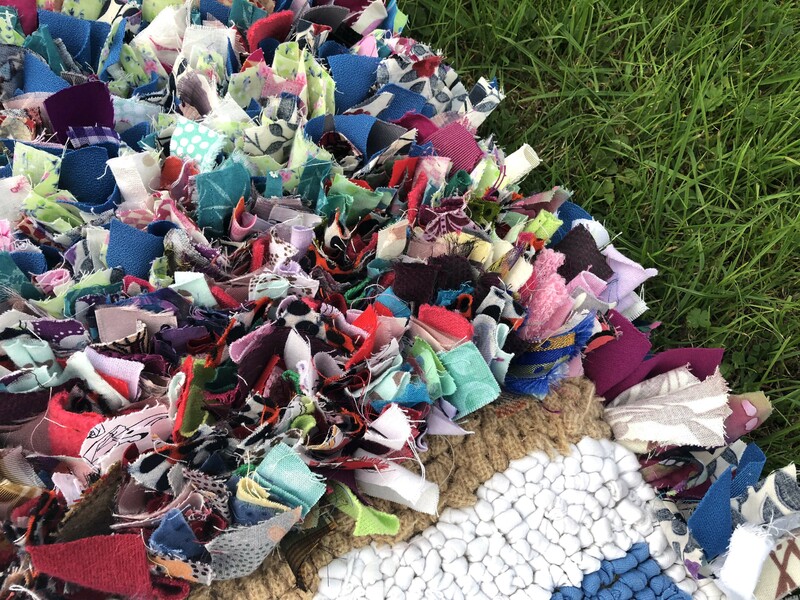 If you’d like to be the first to see our latest rag rug projects, why not join our Rag Rug Community on Facebook https://www.facebook.com/groups/RagRugCommunity/or join our fortnightly newsletter here. As always, happy rag rugging! This entry was posted in Rag Rug Designs, Rag Rugs and tagged 2018, Loopy Rag Rugs, Multicoloured, Rag Rugs, Shaggy Rag Rugs. Bookmark the permalink.